Two ESF in the High School students received youth awards from the Community Wide Diaglogue to End Racism. 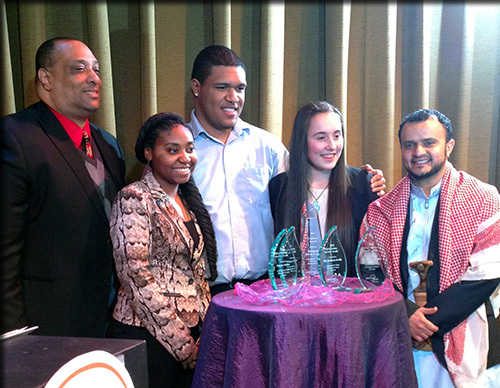 Cimone S. Jordan, a junior at George W. Fowler High School in Syracuse, and Ella Kathleen Neville, a senior at Nottingham High School in Syracuse, were honored during the 2014 Racial Justice Award Ceremony at Syracuse Stage's Sutton Pavilion. Both students are enrolled in the ESF in the High School college dual-enrollment program at their respective high schools. The Racial Justice Award is presented annually to individuals in the Central New York community who are comitted to the principles of racial equity and have worked on the issue of ending racism for a considerable length of time, and whose efforts have produced change or will contribute to make a change in racial injustice.